Good read, with some moral issues. Eleven-year-old Princess Elizabeth, daughter of King Henry VIII, tells about her life through the diary in which she wrote almost every day. Princess Elizabeth does seem to talk about her father being fat all the time, although I think she was concerned about his health, not making fun of him. King Henry had at least six wives, and each of them is mentioned in passing. The princess said that the King's fools are supposed to recite naughty ditties, but that's it. Supposedly there is a ghost that lives in the palace, the ghost of Catherine, one of the king's former wives. Elisabeth's mother, Anne Boleyn, was said to be a witch. This is mentioned a couple of times. Also, astrologers did predict Elizabeth to be a boy before she was born, but obviously, this was a mistake. Two princesses pray quite often, and Princess Mary said to "Let God be first in your heart, and you shall be first in His." Princess Elizabeth said she doesn't care where she is in God's heart, she just wants to know where she is in her father's. The usual mentioning of fighting other countries to rule over them. Everybody drinks wine at the meals. Queen Catherine was said to have been unfaithful to King Henry, and to have been with many other men. She was beheaded for it though. Princess Elizabeth wonders what a kiss would be like. The Princess called Lady Jane Grey a simpering idiot. It is said that Lady Jane recites a bawdy lyric to get the attention off of the Princess. The lyric is not mentioned. It does say that Princess Elizabeth swore a bloody oath that shocked everyone. One lady had a bug fall out of her wig, and into the front of her dress. It is said that the King made a crude joke about it. This was a really good diary. 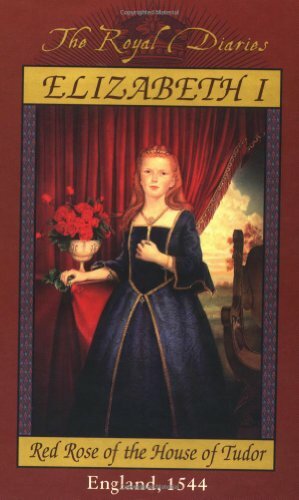 Any preteen or teen girl that enjoys historical fiction would like it. With a bit of truth, and some of the author's imagination, it really swept me off my feet. It does have obvious moral issues, but these aren't surprising considering the characters and events involved. This review is brought to you by BookGenius.